a few months ago, i took a little weekend trip to nashville with a dear friend of mine, to help her find a house. (kid-free, i might add. WOOT WOOT.) we viewed about 20 houses in two and a half days, and obviously worked up quite the appetite. being the good friend she is, she went along to all the foodie places i wanted to hit up while we were there. one of my favorite stops was marche artisan foods in historic east nashville. it’s this charming yet super cool spot to grab brunch or lunch, great coffee and pastries, and lovely atmosphere. 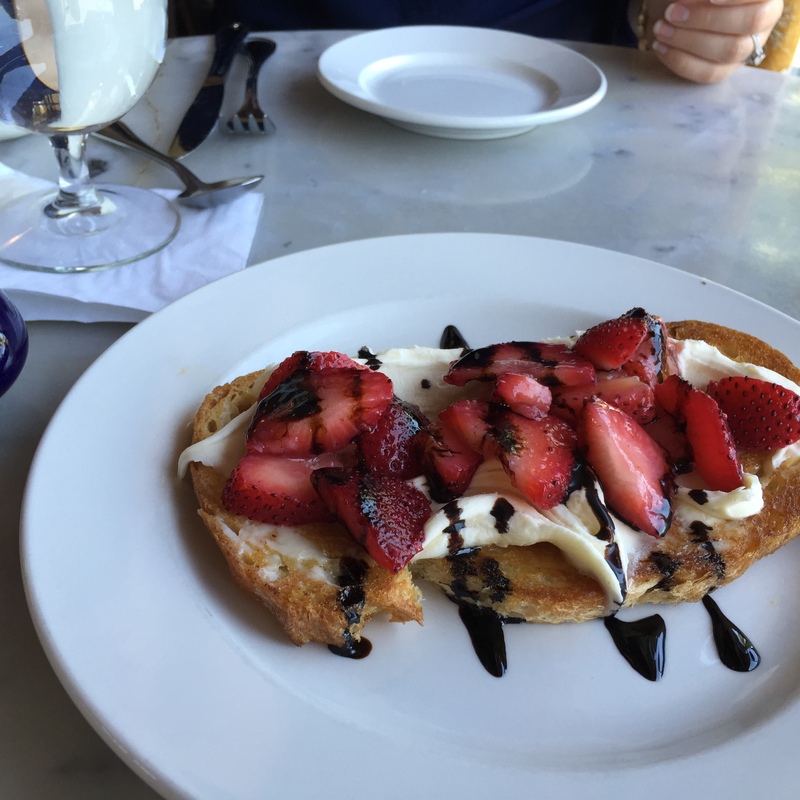 my favorite thing we ordered was their tartine – a fancy toast – with ripe strawberries, sweet mascarpone cheese and a thick, tart balsamic reduction drizzled over the top. you can probably tell from the picture above how AHmazing it was. seriously, i could lick the screen. when we got home, i set out to make it myself. and in may, for my little girl’s fifth birthday, i served this for brunch and was so happy with the reviews. people had fourths, i am pretty sure, because i ran out fast. so if you get out to nashvegas, you must go to marche – you will love it. but if you can’t make it out there, this is the next best thing to their perfect strawberry toast. 2. wash and rinse the strawberries, then slice off the tops and dice them up. put in a bowl and let macerate in their own juices for a bit. 3. put mascarpone cheese into a medium bowl. squeeze in honey and stir to combine completely. 4. when you are ready to serve, cut long sourdough slices in half and toast the bread. (i toast it pretty well so it really stands up to all the toppings.) spread with a light schmear of butter. now generously spread on the mascarpone – i like it really thick. top with diced strawberries and then drizzle with balsamic reduction. repeat for remaining slices of toast. *leftover mascarpone with honey will keep for a week or two in the fridge. **this recipe is enough for a decent sized brunch party – maybe 10-12 people. if it’s just a few people, or a small family – just use 8 oz mascarpone cheese and 1 tbsp honey, and one container of strawberries – instead of making the big batch. this past saturday, we had a birthday party for the little she and all of her friends (her actual birthday isn’t until the end of the month, but with everyone’s schedules in may we decided to start the celebration early:). it was a small shindig at our house (because of near-freezing temperatures – in may – go figure) with kids running everywhere and the big kids enjoying each other’s company, good food and drink. the soon-to-be-3 year old is crazy about waffles so we had a waffle bar, where guests could decorate their waffles with fresh whipped cream, chocolate or peanut butter chips, maple syrup, molasses, lots of fresh berries, rainbow sprinkles, or homemade strawberry sauce. it was by far my favorite topping. and it really was easy to make. i started with emeril lagasse’s recipe and made only a few small adjustments. it is light, fresh, and perfectly sweet. 1. add all ingredients to a saucepan and simmer over medium heat, about 20 minutes. take off heat and let cool for about 5-10 minutes. puree in blender or food processor.pour over waffles, pancakes, french toast, cheesecake, or ice cream. enjoy! summer is meant for relaxing out on the back deck with a cold drink in your hand. and this is becoming one of my new favorites. i made these for the little she’s 2nd birthday brunch party last weekend and they went pretty fast. they are simple (with only 3 ingredients) and super flavorful – perfect for a day out by the grill or makes an ideal all-ages brunch cocktail. 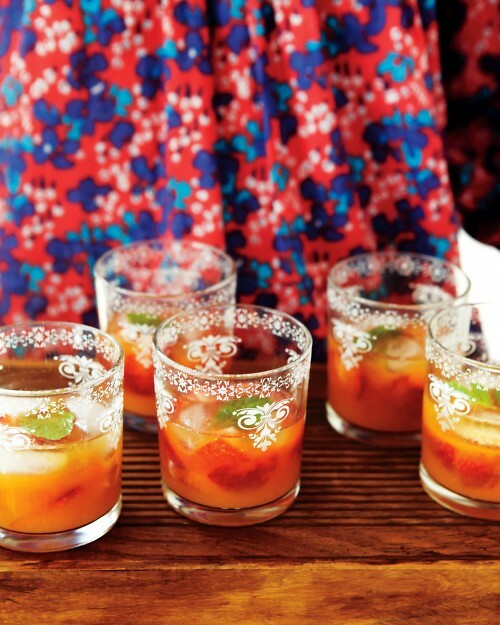 1. set out 8-10 small glasses and place a handful of ice cubes (not crushed) in each one. 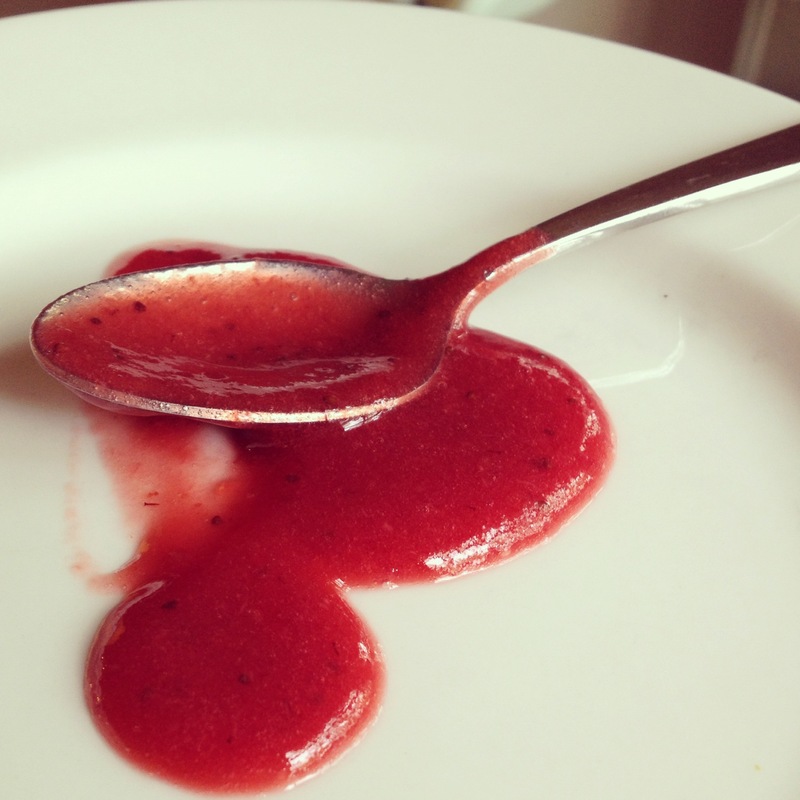 2. place the strawberries in a bowl and gently mash up with a large fork or a potato masher. divide into the glasses. add 2 mint leaves to each glass. (here you could also chop up the mint, if you prefer, and mix it in with the strawberries: total personal preference.) then fill with the mandarin juice and garnish with mint sprigs. **if you are unable to find mandarin oranges, that’s ok. you can substitute fresh tangelo, tangerine, or even good ol’ orange juice if you need to.